ಏಷ್ಯಾ ಪರ್ಪಂಚೊದ ದಿಂಜ ಮಲ್ಲ ಅಂಚೆನೆ ಜಾಸ್ತಿ ಜನಸಂಕ್ಯೆ ಉಪ್ಪುನಂಚಿನ ಖಂಡೊ ಆದುಂಡು. ಭೂಗೋಲೊದ ಸುಮಾರ್ ೮.೭% ಪ್ರದೇಸೊ ಈ ಖಂಡೊಡುಂಡು. ಅಂಚೆನೆ ಪರ್ಪಂಚೊದ ಸುಮಾರ್ ೬೦% ಜನಸಂಕ್ಯೆ ಮೂಲುಂಡು. ಪಾರಂಪರಿಕವಾದ್ ಏಷ್ಯೊದ ಪಡ್ಡೋಯಿ ಪರಿಮಿತಿಡ್ ಸುಯೆಜ್ ಕಾಲುವೆ, ಯೂರಲ್ ಪರ್ವತ ಶ್ರೇಣಿಅಂಚನೆ ಬಡೆಕಾಯಿ ಪರಿಮಿತಿಡ್ ಕಾವ್ಕಸಸ್ ಪರ್ವತ ಶ್ರೇಣಿ, ಕ್ಯಾಸ್ಪಿಯನ್ ಸಮುದ್ರ ಬುಕ್ಕೊ ಕಪ್ಪು ಸಮುದ್ರ(ಬ್ಲ್ಯಕ್ ಸೀ)ಲುಂದು ಪರಿಗಣಿಸದೆರ್. ಸಂಯುಕ್ತ ರಾಷ್ಟ್ರ ಸಂಸ್ಥ ಏಷ್ಯಾ ಖಂಡೊಬಯ ಈ ಪ್ರಕಾರೊ ವಿಭಜಿಸದ್ಂಡ್. ಈ ಪಟ್ಟಿ ವಿಶ್ವಸಂಸ್ಥೆಡ್ ಉಪಯೋಗಿಸವುನ ವ್ಯವಸ್ಥೆದ ರೀತಿಡ್ ಸಂಗಟನೆ ಆತ್ಂಡ್. ↑ Continental regions as per UN categorisations (map). Depending on definitions, various territories cited below (notes 2, 7-10, 12-14, 16-18) may be in ಒಂಜಿ ಅತ್ತಂಡ ಹೆಚ್ಚಿಗೆ Asia and ಯುರೋಪ್, ಆಫ್ರಿಕಾ, or ಒಸೆನಿಯಾ. 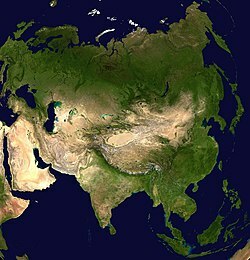 ↑ en:Kazakhstan is sometimes considered a transcontinental country in Central Asia and Eastern Europe; population and area figures are for Asian portion only. ↑ The current en:state is formally known as the en:People's Republic of China (PRC), which is subsumed by the titular entity and civilisation. Figures given are for en:mainland China only, and do not include en:Hong Kong, en:Macau, and en:Taiwan. ↑ ಹಾಂಗ್ ಕಾಂಗ್ ಚೀನ ದೇಶದ ವಿಶೇಷ ಆಡಳಿತ ಪ್ರದೇಶ. ↑ ಮಕೌ ಚೀನ ದೇಶದ ವಿಶೇಷ ಆಡಳಿತ ಪ್ರದೇಶ..
↑ Figures are for the area under the de facto control of the ROC government. Claimed in whole by the PRC; see en:political status of Taiwan. 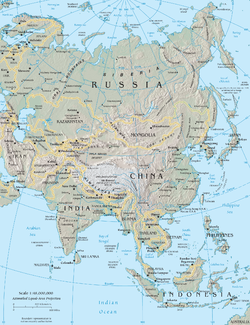 ↑ en:Russia is generally considered a transcontinental country in Eastern Europe and en:Northern Asia; population and area figures are for Asian portion only. ↑ Timor-Leste is sometimes considered a transcontinental country. 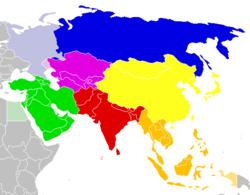 It is geographically in en:Oceania (en:Melanesia), but has historical and sociopolitical connections with Southeastern Asia. ↑ en:Indonesia is generally considered a en:transcontinental country in Southeastern Asia and en:Oceania (en:Melanesia); population and area figures are for Asian portion only, west of the en:Wallace line. ↑ en:Armenia is sometimes considered a transcontinental country: geographically in en:Western Asia, it has historical and sociopolitical connections with en:Europe. ↑ ೧೨.೦ ೧೨.೧ en:Azerbaijan is often considered a transcontinental country in Western Asia and Eastern Europe; population and area figures are for Asian portion only. en:Naxçivan is an autonomous en:exclave of Azerbaijan bordered by en:Armenia, en:Iran, and en:Turkey. ↑ The island of en:Cyprus is sometimes considered a transcontinental territory: in the Eastern Basin of the en:Mediterranean Sea south of en:Turkey, it has historical and sociopolitical connections with Europe. The en:Turkish Republic of Northern Cyprus (TRNC), distinct from the de jure Republic of Cyprus in the south (with a predominantly Greek population), is recognised only by Turkey. ↑ ೧೪.೦ ೧೪.೧ Gaza and en:West Bank, collectively referred to as the "Occupied Palestinian Territory" by the UN, are territories partially occupied by en:Israel but under de facto administration of the en:Palestinian National Authority. ↑ Georgia is often considered a transcontinental country in Western Asia and Eastern Europe; population and area figures are for Asian portion only. ↑ en:Turkey is generally considered a transcontinental country in Western Asia and Southern Europe; population and area figures are for Asian portion only, excluding all of Istanbul. ಈ ಪುಟೊ ಅಕೇರಿಗ್ ತಾರೀಕ್ ೫ ಜುಲಾಯಿ ೨೦೧೭ ತ್ತಾನಿ ೧೬:೨೮ ಗ್ ಬದಲಾತ್ಂಡ್.